Co-de-iT, team member of the digifabTURINg lab, is happy to announce we started a Github webpage about our robotics explorations. We started releasing the code & documentation about the Claystruder project. 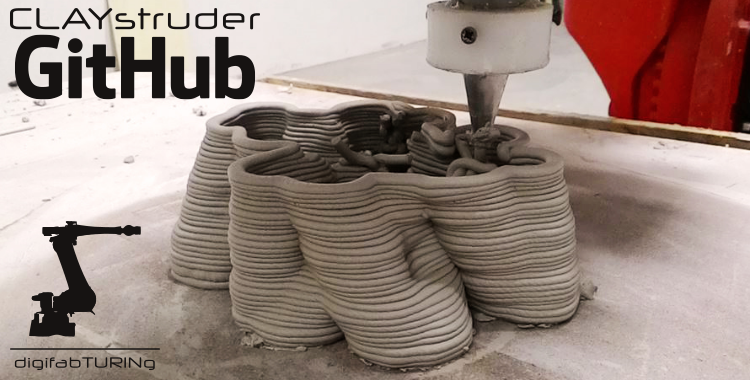 The Claystruder project is part of the digifabTURINg research, that are a research cluster focused about digital fabrication + robotic automation and material research applied in the field of architecture, interaction design and art. digifabTuring rises from a collaboration between several partners: Fablab Torino, Officine Arduino, Co-de-iT with COMAU and Toolbox Coworking. We have developed an hybrid extruder system to print clay and other dough, that we use with a COMAU NJ60 anthropomorphic arm. The pneumatic system move the clay to the screw conveyor to print the material.